Type N(F) Quick connectors are standard or specify UHF Quick connectors at no charge. Elements not included, sold separately. All new, two year warranty. 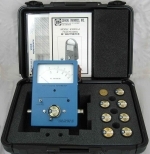 Wattmeter and rugged custom foam padded carrying case. Includes laminated VSWR Calculator Chart. Peak/Average power reading Model 83000A (shown) or Model 81000A (not shown) Average power reading, select in options below. Elements (sold separately) are 100% compatible with Bird Model 43/43P wattmeters. See the wattmeter details below for each model.